At the end of the day, you can usually find me sitting at the kitchen table eating supper with Gary, my husband. While we eat, we tell each other about the day. Sometimes there’s not much to tell. Other times, supper is over but the conversation isn’t. So we walk the neighborhood and keep talking. It’s our way to reconnect. For centuries, Christians have practiced a similar custom with God the Father. They prayerfully connect with Him at the end of the day. They review the day with the Father asking for his help to see his presence, and at the same time, to see oneself more clearly. This practice is called a few things—the daily review, the examen, examen of consciousness, examen of conscience or the Ignatius Examen. And there are various ways and times to practice it, just like I connect with my husband in different ways from day to day. Some practice it daily—at night before going to bed, lunchtime, or on the commute home from work. 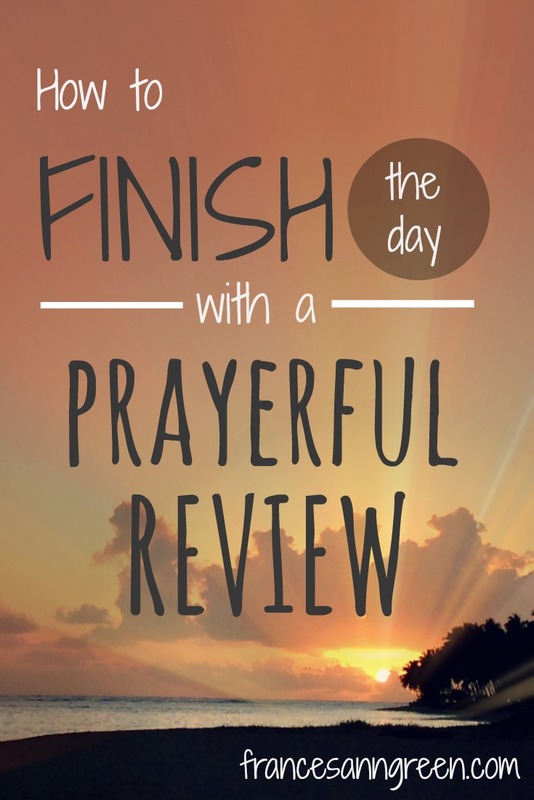 Others do the review with God at the end of the week. It’s a meaningful reflection with the Lord because it’s about more than the activities of the day. It’s about the movements of the heart. It’s listening. It’s paying attention. It’s vulnerable. And inevitably, in our openness with God, we encounter his love. Today I want to share with you a prayer that I adapted from Psalm 139 and 51 for the daily review. I hope you will use this Psalm to connect with the Lord at the end of the day. May it lead to transformation of the heart and an awareness of God’s loving presence. You discern my going and coming. There is nowhere I can go away from your presence. Your Spirit is always with me. There is no distance too far from your reach. There is no night too dark for your light. Let your Spirit guide me now. so I will know you and myself more fully. Open my eyes, O Lord, to see your goodness. Thank you, Lord, because your works are wonderful. What can you give thanks for as you review the day—a meal, family, friends, a job, nature? Look for times in the day you want to thank God for being present. Open my eyes, O Lord, to see my heart. You have searched me, O God, and you know me. You’ve tested me and know my anxious thoughts. Give me insight as I look back at the day. Open my eyes so I will see you and see my heart. Pay attention to your feelings throughout your activities. Did you feel excited, sad, anxious, angry, happy, fearful, embarrassed…? What do your feelings reveal about yourself or God? How were you drawn to God today? How were you pulled away from him? When did you exhibit the fruits of the Spirit the most? When do you wish you exhibited more of the fruits of the Spirit? Is there an event that stands out from the day that you want to pray about? Pay attention to the movement of your heart as you review the day with his guidance. Open my eyes, O Lord, to see my offensive ways. so give me wisdom in the inmost place. according to your great compassion. Wash me and forgive me of my sins. Open my lips, O Lord, so I will praise you. Thank you for guiding me through this reflection. I will begin the day with you. Thanks for sharing your experience with the examen over the past year. There are so many ways to practice it, I’m glad that this prayer can be added to your toolbox.